We now have over 110 events and programs listed on the Jane Jacobs at 100 website and more are being submitted daily. You can submit yours on our Submit an Event page. Even if you don’t have an idea for a walk, talk, event or program, you can still contribute to our efforts to celebrate Jane Jacobs. Use use the Hashtag #JJ100 when posting an image to Instagram or when Tweeting or re-Tweeting. 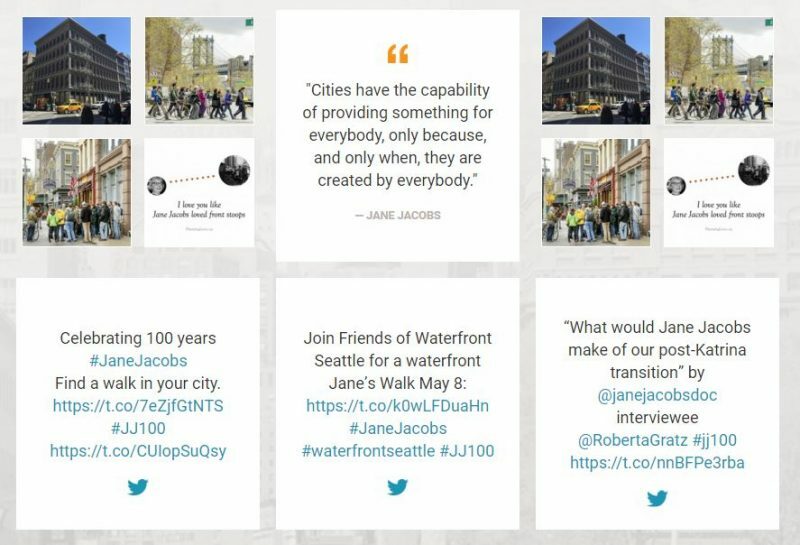 So, if you see a news item or great tidbit related to Jane Jacobs, civic engagement, community, activism, “eyes on the street” or a topic you think is worth sharing, just tag it with #JJ100!